The summer is upon us in France, and with it comes the heat. Many people like iced tea at this time of year, simply because they want a refreshing drink. But it’s funny that in regions where it is very hot – like the Sahara, but there are many other examples – people tend to drink their tea hot. In fact, hot tea is considered more refreshing than cold tea. This is because the closer the liquid’s temperature is to body temperature, the less it will provoke a temperature change. And this temperature change is one of the reasons we sweat. Our love of iced drinks comes from the other side of the Atlantic, and when a food-related fashion arrives from that region, we are not necessary wrong to question it. My suggestion for fans of iced tea is to shun the overly sweetened – in my opinion – commercial varieties and instead to make your own delicious teas using water at room temperature, and to drink them chilled. 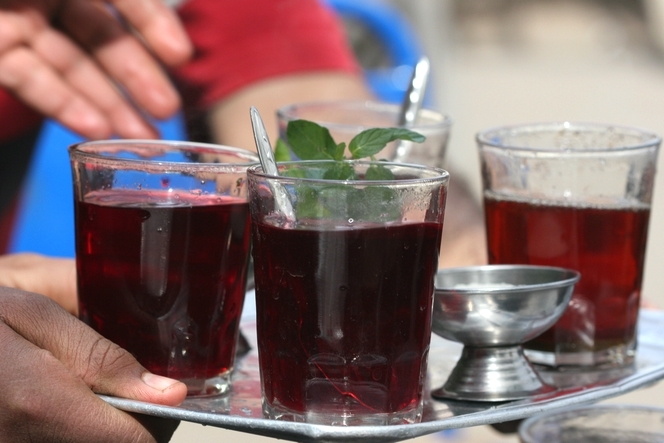 Or, as I am here to tell you about the different customs relating to tea, you can also celebrate the arrival of the warm season by drinking a hot tea with mint leaves, like this one, served on the banks of the river Nile. When I drink tea on a hot day, especially if I have been working, I want to drink very cold tea. I seek a reduction in my own body temperature, and I prefer my tea to be at about 1 degree Celsius. I can feel the stream of the cold tea going down my throat and hitting my stomach, splash. It quickly warms up, but at the same time I grow cooler. Yes, I might sweat a bit, but that’s why I have the bandana tied around my head, and I can take showers now and then.